This entry was posted in Poems and tagged 2008, Edwin Morgan on January 10, 2013 by kate. 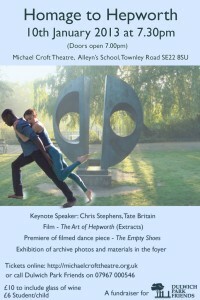 Performed at the Homage to Hepworth on 10th January, 2013, Kate’s poem profil perdu after Hepworth’s Two Forms Divided Circle, originally a sonnet, has been shaped and can be watched as it disappears, on the “profil perdu” page. Thanks to Trevor Moore for the powerpoint from which the “code” was developed and to Herb Miller, who animated the poem. This entry was posted in News, Poems, Readings on January 10, 2013 by kate.